Visual artist Remigia Biskupská (born in 1927, Ružomberok) received artistic education at the faculty of Education of the Comenius University. She started with drawing and painting and then has redirected her attention to wire. She started to use it occasionally in the early 1960s. Wire was not a typical artistic material at that time. Remigia Biskupská adopted traditional manual processing of the material for her purposes. She was the only woman artist who used wire for creative purposes in jewellery for twenty years. Her first jewellery pieces were symmetric and with very unique ornaments. In the mid 1980s, she made abstract wire drawings. In the 1980s and 1990s, she made jewellery with semi-precious stones in central position and ceramics with abstract decoration. 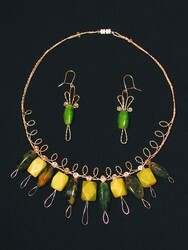 At the turn of the millenniums, she made a collection of necklaces and pendants from wire and semi-precious stones. In the recent decades, she has added new types of necklaces, one with no fastening and the neckband. Retrospective exhibition and book The Waterfall of beauty – wire and colours in hands of Remigia Biskupská (June - August 2012, Martin) present the work of this visual artist.